There are affiliate links in this post – please read my full disclosure policy here. Ever wish that making from-scratch meals at home didn’t take so much time? Yeah, me too! I make pretty much every meal that we eat from scratch, 3 times a day, 7 days a week. Thankfully after doing this for 9+ years, I’ve learned a few tricks along the way that have helped me speed up the process! There’s something about already having your meat cooked and prepped that just makes it so much easier to throw together a meal! And it makes preparing soups such as Salsa Chicken Soup or Creamy White Chili especially fast because you don’t even need to take the time to thaw the meat! It’s handy for other dishes too, you just have to plan ahead a bit more. For instance, you can use cooked chicken to quickly throw together Salsa Ranch Chicken Wraps or Sour Cream Chicken Quiche. Bacon or Sausage work well in breakfast sandwiches, wraps and quiches. And dishes like Deep Dish Taco Squares and Cheeseburger Casserole are a cinch with already cooked ground beef. Sometimes I cook up the meat as soon as I get home from the store and other times when I cooking up meat for a recipe, I just cook extra and then freeze the unused portion to use later. And I personally love using these freezer boxes to freeze my meat and other food in. They end up saving a lot of money too because, unlike freezer bags, you can reuse them over and over again. I often make double batches of things like No Boil Oven Ready Lasagna, cookies, breads/rolls, casseroles and even soups. We’ll either just have that food twice in one week or, since I have plenty of freezer space, I’ll freeze it and pull it out later for an easy meal. It’s amazing how much time this can save! Not only do you save yourself time doing dishes because you are only prepping once, it only takes a couple of extra minutes to make a double recipe of something, saving you quite a bit of time in the long run. If you don’t have food on hand to cook with, you are going to find it way too easy to cave and either buy pre-made meals or go out to eat! Figure out what items are regulars on your menu and in your fridge and pantry, then try to keep your kitchen always stocked with those things. Here are some of the items that I try to always have on hand. With these things alone, I can easily make lots of basic meals! Keeping your kitchen stocked doesn’t have to break the bank, though. Simply build your stockpile by purchasing things that you use when you see them at rock-bottom prices. Tip: Keep a running grocery list. As soon as you use one of your “regular” items, add it to your grocery list so that you can restock your supply. Unfortunately, I’m not one of those people that does well at making a menu plan and sticking with it, so another life saver for me is to make one pot dishes, many of which also use the crock-pot. Being able to just throw everything together into one dish and call it done keeps meal prep easy and saves the night when I fail to plan ahead like I should. And even if I decide to cook a separate veggie or make a salad, it still feels very manageable! Remember how I mentioned that I love making double batches of things and then putting half of it in the freezer? Being able to pull out that casserole/bread/dessert later for an easy addition to our dinner helps me so much. My biggest challenge is remembering to get it out in time to thaw! I don’t do this as much as I’d like to, but occasionally I’ll have a freezer meal cooking day where I make a whole bunch of food specifically to put in the freezer. If you are interested in doing lots of freezer meals this is an ideal way to pull it that off. Tip: Happy Money Saver has a great post with lots of tried and true freezer meal ideas as well as a few tips on how to do a big freezer meal cooking day. Check it out! What do you do to make meal prep at home easier? I love and agree with all these tips. I follow all of these as well to keep our grocery budget at $65 a week for a family of four! The cooked meat feels so good knowing you can just add in the rest of your ingredients. Sometimes we forget that we have enough items in our pantry to make a quick meal without running to the grocery store! Thanks for sharing these awesome tips! Yes, I think the cooked meat tip is one of my favorites! When I started doing that several years ago, it immediately made meal prep so much easier. Making double batches is such a great tip! I do that when I make chili and so I almost always have chili in my freezer. It doesn't take me any extra time! I just need to start doing that with more recipes. Oh my goodness! Yes- yes-yes for #1! It makes throwing together a meal so much easier then there is cooked meat in the freezer ready to thaw out. I love you list and am sharing on my blog's Facebook page this afternoon! Thanks, Ashley! And yes, the cooked meat makes making a meal about half the work I think. These are great tips! I do most of them, but I need to start having the cooked meat on hand. That would really help with getting a meal on the table quickly. Oh, you'll love it, Jann! It makes things so much easier! I'm a big fan of the stocking up! Especially when I'm able to stack coupons and deals. Freezer meals are on my to do list haha. I hear you on the freezer meals, Betsy. I still have yet to do a big freezer cooking day even though I've wanted to try it for years. I do best at just doubling recipes and putting stuff in the freezer that way. These are great tips. Very helpful to stock up on items ahead of time. I love all these tips! Meal planning and a little bit of prep have made all the difference in my sanity and grocery budget! I love keeping cooked meat on hand. It makes things so much easier. Also, freezer cooking and I are BFFs. Great tips! I should learn more from you about freezer cooking! I have wanted to do a big freezer cooking day for a couple of years and have yet to actually get it done. :) I do better at just doubling recipes that I'm already making and freezing the extras. Oh my gosh, I seriously have to get better at freezing the food I make, I make huge batches and end up having to toss what I don't use. Thanks for the reminder! Having cooked meat on hand is something that will save me alot of time. The other day I went to make chili and on top of an already busy day I remembered that the meat had to be cooked. If that would have been ready so much time would have been saved. Yes, having meat in the freezer works so well for soups since you don't even have to thaw it. It has been a lifesaver for me many times on a hectic day! These are some great tips! I have an 11 month old son and I realized I use some of these tips to save time when making him lunch, but I don't for myself! I ALWAYS have meat and protein readily cooked for him, and I should just do the same for myself as well! It can be so hard to stay on top of it all the time, Morgan, but it really does help me out a lot! Sometimes that one simple thing can keep me from saying, "Let's just get pizza tonight!" 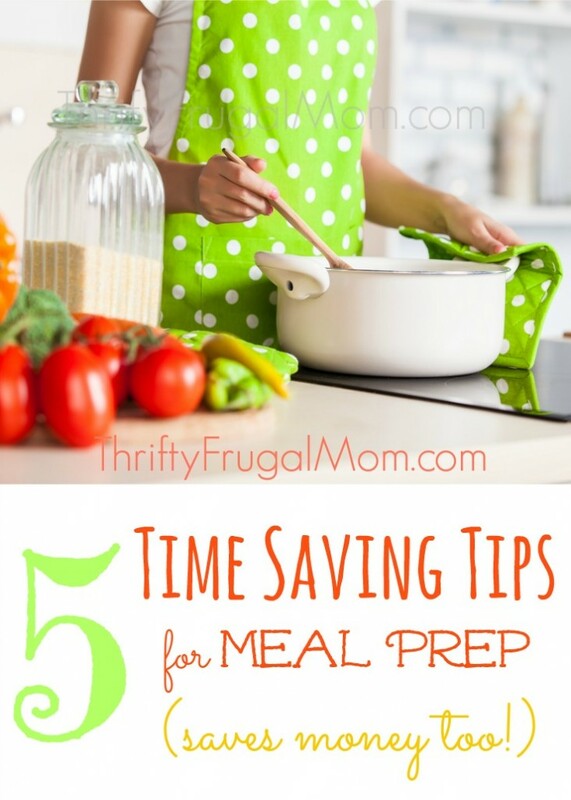 Wow what a thorough list of tips for saving time on cooking meals at night. I can't tell you how many times I've gotten off work and was too exhausted to slave over the oven to cook dinner. I will definitely be preparing freezer meals and crockpot meals for the future. Thanks so much for the amazing tips!